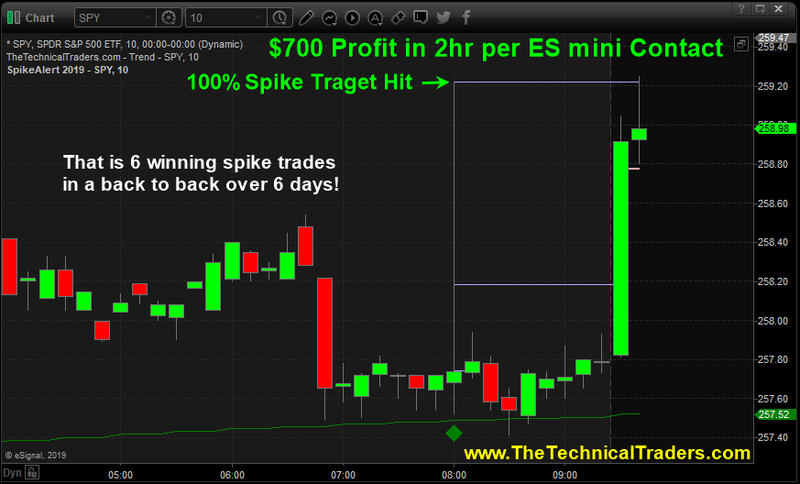 This Weeks First Trade Setup – Technical Traders Ltd.
It’s hard not to get excited when we kick start the week with a winning trade within the first 2 hours of trading. Our proprietary price spike trading strategy that has generated 6 winning trades before the opening bell for the last 6 days in a row. Also, what is really exciting is that we have had 5 winning Gap Window Trades in the past 6 days as well. that’s 11 winning trades in 6 days and no losing trades! These daily emails have helped immensely. This is the best and most practical service I’ve used in the 6 years I’ve been trading. Housekeeping Notes: Please note we are in the process of upgrading this trading newsletter to become a full trading suite for long-term investors, swing traders, and day traders complete with our live updating trading charts, analysis, and signals. The trades in our portfolio only represent ETF swing trades and not our price spike, gap window, or cycles based trade setups, but all trades will start to be posted and tracked in their own areas of the site once we complete these upgrades for you. Over the next 30-60 days, there will be incredible value added to the service which you will not find anywhere else. The analysis, tools, and trade setups will improve the way you see the markets and trade no matter what time frame your focus is on (investor or active trader). Exciting stuff and let us know what you think would be valuable for us to improve on and add to the member’s area for you.